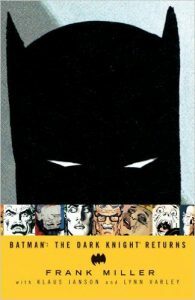 The Dark Knight Returns is the most grim Batman story I’ve read. Set in a dystopian future (which has a very 1980s feel to it), Bruce Wayne has retired from his life of crime fighting and is no longer the Batman. But Bruce Wayne hasn’t retired because crime is no longer an issue – if anything, Gotham City is facing worse levels of crime than it ever had before. Really, the city is falling apart and all of this is set against a backdrop of the rising tensions of the Cold War. I don’t believe I’m spoiling anything by saying that Bruce Wayne becomes Batman again (it’s in the title), but when he does so, he is a very different person. Over the years he has become rather disillusioned and now he must face threats and villains much more extreme than anything he’d ever faced before. Thoughout this, he is joined by a new, female Robin. Though I love a lot of the ideas that went into this graphic novel, I have to say that I just couldn’t get into it like I got into other Batman comics. What I like about the others was the kind of charming mystique of Gotham City at night, combined with whatever unsolved case Batman and Commissioner Gordon are working on at the time and contrasted against the very slightly campy designs of the characters. The Dark Knight Returns is bleak and depressing and the art (by both Miller and Klaus Johnson) reflected this: it deals with a lot of unpleasant subjects and as such is rather unpleasant to look at. 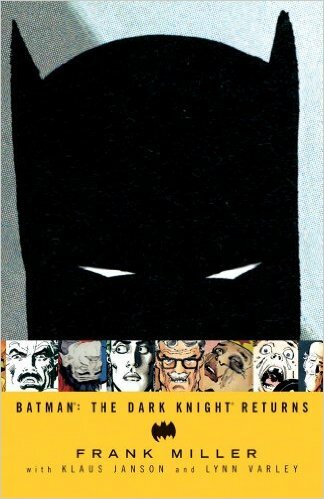 I don’t want to say that The Dark Knight Returns is bad (there are many aspects of it which I really appreciate) it just failed to captivate me in the same way that other stories about Batman had done. A part of it might be that Batman is a lot colder and less moral this time and that there are generally no “gateway characters” for me to relate to. The new Robin was probably the closest thing, but she felt under developed and I’d have liked to see more of what she thought and felt about everything. Plus, I wasn’t really sure that I agreed with the “message” it was trying to convey at times.